upcoming posts on IBM Bluemix,Devops,Worklight,Node js. Event sequencing provides the ability to sequence incoming events to an SCA component in WebSphere Process Server. Export bindings are the entry points to the target SCA components. For event sequencing to be enabled, the exports must process and deliver messages in the same order in which those messages are received. Use the esAdmin command to list, unlock, or delete active and queued locks. The esAdmin command can list and delete all locks currently managed by the lock manager. When listing locks, you can list all locks or a small subset that is filtered based on the module, component, or method. This command can also be used to release an active lock in a deadlock situation; after the lock is released, it is granted to the next queued request. Verify the name of server on which the application (module) is deployed. Log in to the administrative console and navigate to Servers > Server Types > WebSphere application servers. Click the name of the server from step 1 and expand Ports on the right side of the page. Note the SOAP_CONNECTOR_ADDRESS and use this to specify the soapPortNumber. 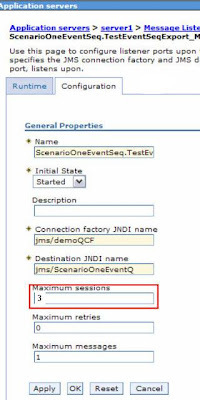 Use an event sequencing qualifier to ensure that events are processed in the order that a service receives them. Apply the qualifier to the interface operations that you want to include in a sequence. The group identifies which operations will participate in a sequence. The key identifies the value for which the events are sequenced. The qualifier ensures that operations in the same group that have the same key value are processed in the order that they are received. In Figure 1, you can see that we have loaded an MQ queue with fictitious purchase order (P.O) requests. All the records of the same color must be processed in order, but the purples, blues, and reds can be processed in parallel. Event sequencing guarantees that each color is processed in the sequence they are in the queue, while still allowing the other colors to be processed independently(Multiple Threads created when u specify in maximum sessions in MQ listener) . Without event sequencing, the records are processed serially to keep their order. The messages that need to be processed in a sequence are put into the MQ Ext Queue by the client application. The listener port defined on Process Server is listening on this queue and reads one message at a time from the MQ Ext Queue, sequences it, and then puts it on the SCA Int Event Queue. The messages from the SCA Int Event Queue are being read by Process Server for processing, provided that there is a lock available in the Event Lock table (Figure 5). A lock is applied if there is more than one message with the same sequence ID. If there is a lock on a given sequence ID, then that message is not processed until the lock becomes available. By default, Process Server provides 100 locks to process these sequenced messages. These locks are configurable for the runtime. Let’s say you have an insert record followed by Update #1 record and Update #2 record that need to be processed for a given sequence ID. If Update #1 fails to process due to some issue (for example, bad data in the message), then you can optionally select during design time to continue with the processing of Update #2, or you can wait until Update #1 has been corrected and processed. This feature is called strict ordering of messages. This feature needs to be appropriately selected at design time in WebSphere Integration Developer. Figure 6 shows this feature. The failed transaction will show up in the Failed Event Manager from where you can modify the data and re-submit it for processing.